This afternoon, Chris Christie announced his candidacy for president at his alma matter, Livingston High School. 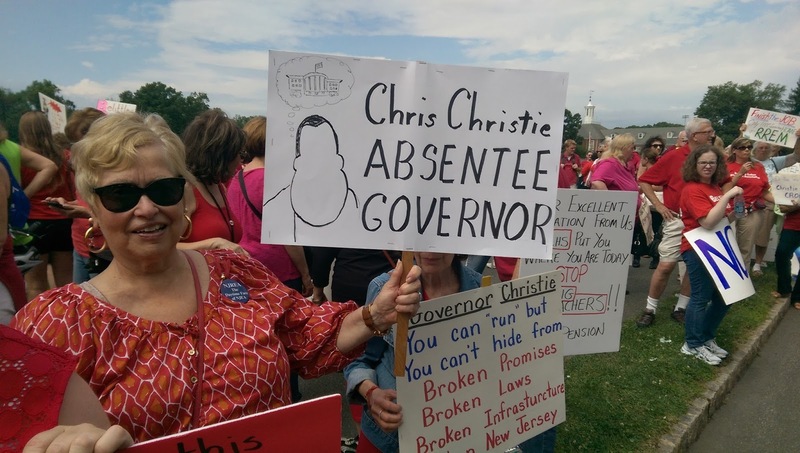 The superintendent of the district, Jim O'Neill, skipped the event, as he understands just how bad Christie has been for this state's public education system. Christie is many things, but he's not a fool. Given his dismal approval ratings, he knew he was likely to have a throng of critics at his announcement. That's why he kept the location secret until it leaked out last Thursday, giving detractors little time to organize a counter event. 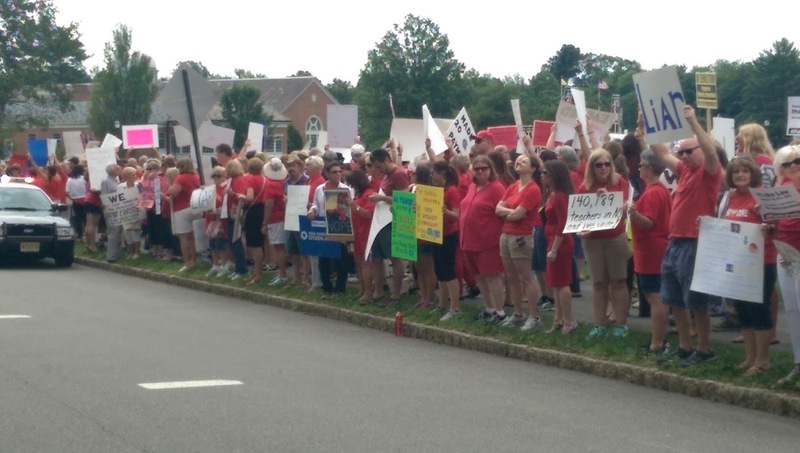 It's a testament to Christie's deep unpopularity, then, that so many people -- especially teachers -- showed up today in Livingston to condemn Christie's record of failure. And it's a testament to Christie's cowardice that he held his announcement in a closed gym, away from the people who understand the consequences of his horrible tenure as governor. My invitation to go inside for the speech must have been lost in the mail. 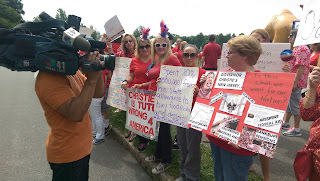 Instead, I milled around, taking pictures and speaking with teachers and others about the train wreck that is Governor Chris Christie. Here's what I saw and heard. Sorry for the missing names, but it was chaos; this was a big, peaceful, but angry crowd that had a lot to say. By the way: it was great fun meeting all of you who read the blog. Many, many thanks for your support. 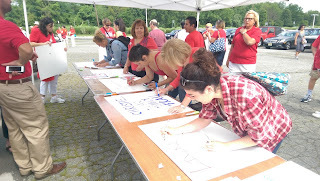 Teachers making signs before the rally. 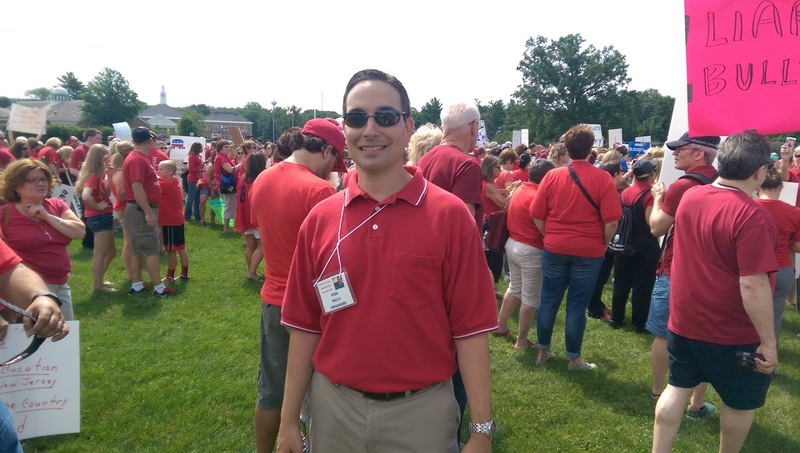 Mike Mignone, President, Belleville Education Association, teacher, poster boy for tenure: "He's not a leader. A true leader acts on what he says. But his actions don't match his words." 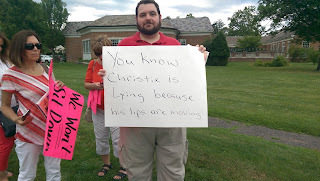 Teacher in Hudson County: "He's spewing lies about teachers. My husband and I are both teachers, but my husband is working three jobs. Our house was hit by Sandy, and it took us a long time to get the insurance money. We didn't get any help from the state. My husband's working right now; I left my kids with my mom to be here." Retired teacher: "He's wasted billions of dollars. 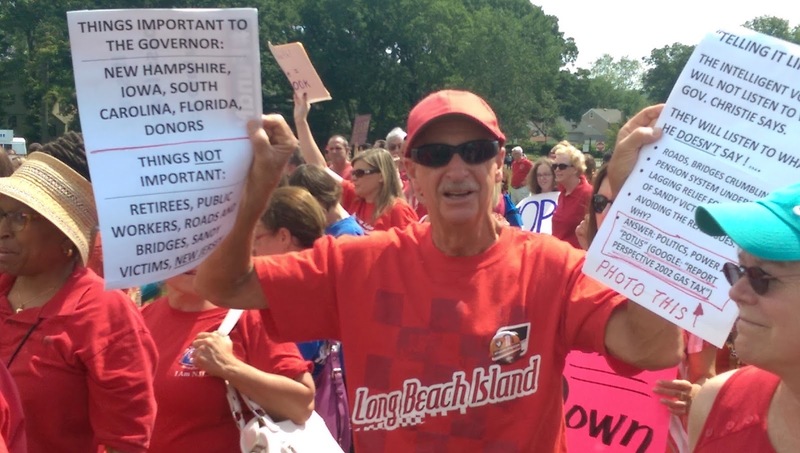 He ran the state into the red, and he now says there's no money for the pension. But the money was there; he just wasted it." Teacher from Bloomfield with 4 years of experience: "I don't regret going into teaching, but I am very nervous. Our benefits are down, and our payments are up, and we aren't paid a lot. I do this for the love of the job, but I'm worried I won't be able to continue." Jesse Turner, the Walking Man. Nancy Ooms: PE teacher at Livingston High School who actually taught Christie when he attended: "He was nothing like this. It's hard to believe he's forgotten about this place and all of us. He says we work a part-time job, but I work day and night." The crowd gets ready to greet Christie. Mark Worobitz, retired teacher, Sparta: "He says we do a part-time job? HE does a part-time job, for a full salary. He's traveling all over the country, worrying about pigs in Iowa and syrup in New Hampshire, instead of what's happening here." Teacher from Ridgefield Park: "If he had just left the money he gave to corporations in the pension, he could have made the payments. Our state's credit is nothing. People can't find jobs -- but all of his friends have jobs." 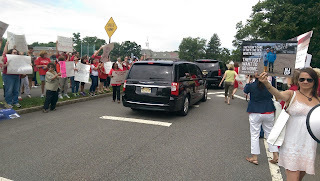 Christie's limo, windows tinted, drives by while people boo. English teacher, Livingston High School: "We're planning, grading, writing curriculum. We work over the summer. We meet with our co-teaching teams to plan. I work all evening, taking questions from parents and students on the internet. What should I do: stop working at 3:00 PM?" @TickTockMrsGlock: "My husband's a police officer. We've both made 678 pension payments, but he's made none. 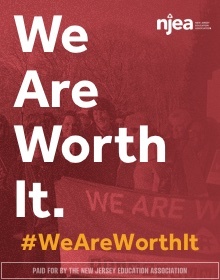 We came into our jobs knowing we wouldn't make a lot of money, but we would make a difference." Retired teacher, Parsippany: "He has an impulse control disorder. Imagine him in a room with Putin!" Jersey City teacher: "He has failed for New Jersey, and he will fail for this country." 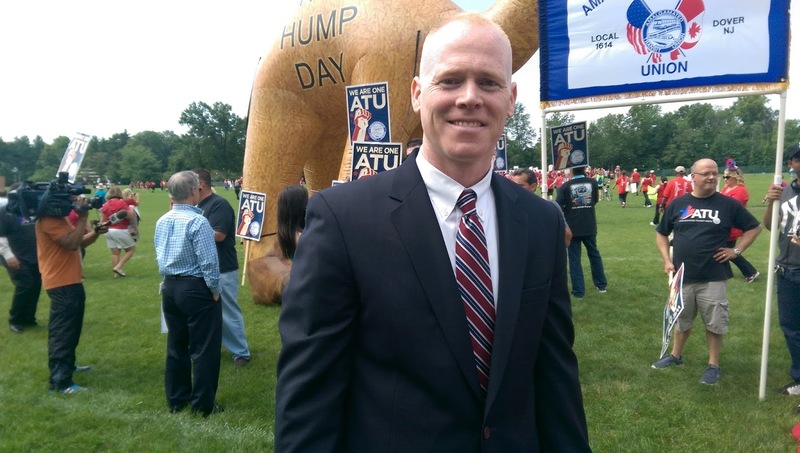 Jim Keady, candidate for State Assembly (aka Mr. "Sit down and shut up! "): "Chris Christie has been an abject failure as a chief executive. The pension is becoming insolvent. Our bond rating is in the toilet. Our job recovery is terrible. He should do his job and show some results -- then maybe he could be considered a candidate for president." 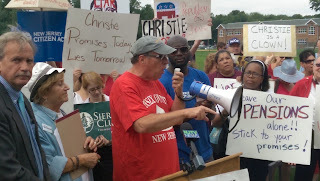 Anthony Rosamilia, teacher at Livingston High School, president of Essex County Education Association, and chief organizer of today's rally: "We're here to send a message to the rest of the country: if Chris Christie becomes president, it will be a disaster for the nation. I teach here. To choose this location for his presidential announcement is rubbing our faces in it. We had to do something." Livingston High School teacher: "Christie's mother worked in this district, and collected a pension until the day she died. She was a wonderful woman. I don't understand what happened to him." John Samtak, retired teacher from Pequannock: "He can't be trusted. The first thing he said back in 2009 was: 'I won't touch your pensions.' 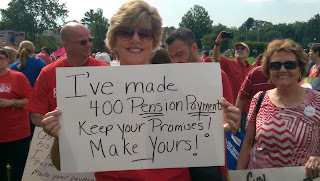 The first thing he did was touch our pensions." Melissa Katz, education student and education activist: "As a future teacher, I think the hypocrisy of his announcing a run for president at a public school is appalling." 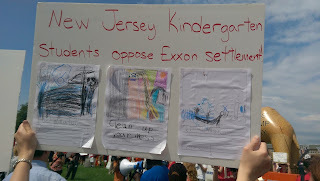 Teachers from South Orange-Maplewood: "He's dishonest. He will do anything to have the bully pulpit. He cannot imagine a world where he is not the big cheese. But he's not going to win; he's probably just auditioning for Fox News." Awo Okaikor Aryee-Price, Ikechukwu Omyema, Elizabeth Cornell, Mel Katz. Awo Okaikor Aryee-Price, teacher and education activist: "Chris Christie is not a president for all people. He has been a persistently imposing force for the people of Newark to block any local control. Recently, he backed off only to get votes." 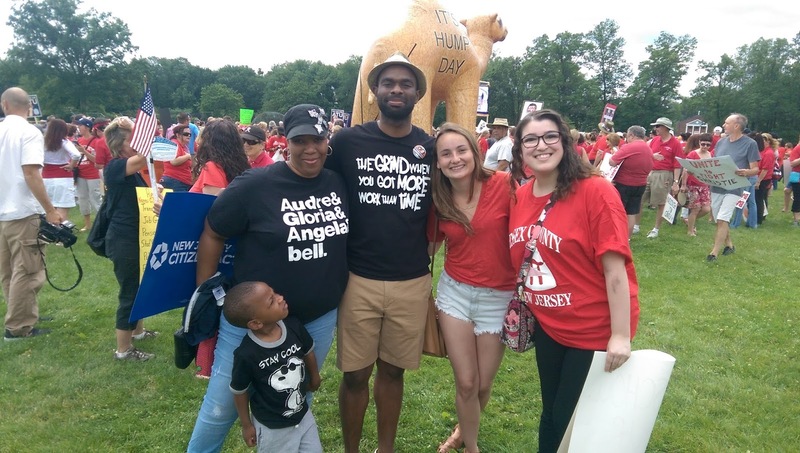 Ikechukwu Omyema, teacher and education activist: "I left teaching in Newark, and the State Superintendent [Cami Anderson] is the reason I left. She drove out good teachers who were tired of disrespect. 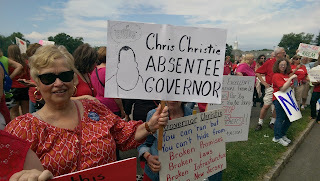 Anderson's ridiculous policies were only in place because of Chris Christie." Waiting for the buses back to the parking lot. Bill Cole, educator in Morris County: "By any metric Christie is a dismal failure. We're one of the lowest performing states economically. He catered to the one-percent on the backs of the middle class. He has nothing to point to; where are his successes?" 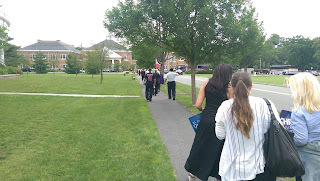 Christie supporters had to walk by the teachers waiting to take buses back to the parking lot. I asked many of Christie's supporters as they left what they like about him. To a person, they said some variation of: "He tells it like it is." Propaganda works -- at least on some of us. 1) He'll be around here a lot less. 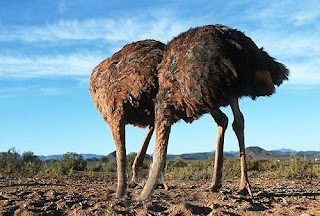 2) The other Republican candidates are finally going to make his record in New Jersey a topic of scrutiny. Fellas, you can use anything you find on this blog, but I'll warn you -- there's a lot of failure documented here. Enjoy. 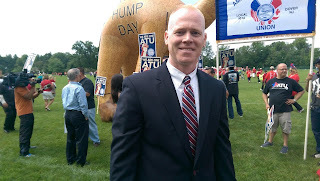 Why Should Newark's Families Settle For an Unqualified Schools Superintendent Like Chris Cerf? Cami Anderson, reviled by many of the stakeholders in Newark's schools, is leaving as the State Superintendent. Given the many failures of the unqualified Anderson -- including a huge budget deficit, the chaos of her One Newark plan, and the poor performance of her "renew" schools -- that's good news. Governor Chris Christie and Mayor Ras Baraka have reached an agreement to create a "roadmap" to restore local control of the school district, a privilege enjoyed by all affluent suburban districts but denied to Newark for two decades. Given Christie's habit of breaking his promises, people are understandably wary; however, this is the first time this governor has agreed that local control must eventually return to Newark, and that's good news. Unfortunately, we know now who will be running Newark's schools during the transition to local control. Chris Cerf, former Commissioner of Education for the entire state, is coming back from yet another junket in the private sector and will run the district for the foreseeable future. Those who've followed my writing over the years know that Cerf has a questionable track record, both in and out of the public sector. The former president of Edison Education, Cerf oversaw several disastrous experiments in school privatization in Philadelphia and Baltimore. His time working in the New York City schools was marked by allegations of conflicts of interest and mediocre performance. While working for Christie as the head of the state's Department of Education, Newark's schools (as well as the rest of the state) saw an unprecedented retreat from adequate funding as defined by the state's own laws. Cerf imposed an illogical and expensive teacher evaluation system while greatly expanding standardized testing, over the objections of both Mayor Baraka and Newark's students. Cerf has always been a huge proponent of charter school expansion; he even recently accepted an appointment to the board of the National Alliance for Public Charter Schools. Yet he never acknowledges that these schools can cause real damage to the finances of their host districts. He lauds charters' "successes," while blithely dismissing the fact that the charter sector does not educate nearly as many children who have special education needs or who are Limited English Proficient as its hosting district schools. Cerf's firm, Global Education Advisors, actually came up with the proposal to expand charter schools in Newark. After Christie announced Cerf as his pick to lead the NJDOE, Cerf changed his story about the extent of his involvement in drafting that plan. There is no question, however, that Chris Cerf was one of the primary forces behind contracting Newark's school district while expanding charters. Why, then, does it make sense to appoint a man to lead the Newark Public Schools when he was directly involved in shrinking the district? Especially when that man is unqualified to lead any locally-controlled district? Chris Cerf taught for a few years at a tony private school; he's never taught in a public school, let alone led a district. He holds no degrees in education, and he has no standard certification in school administration. He's never been an instructional leader, he's never been at the helm of a public school district, and he has no record of building consensus within a community so schools can be improved. The plain truth is that if Chris Cerf applied for a superintendent job in the suburbs, his resume would be stamped "Unqualified" and thrown into the trash. Yet here he stands, ready to take on the toughest school leadership job in the state. New Jersey has many proven school leaders with records of real success in leading urban school districts. Why weren't they considered for the job? 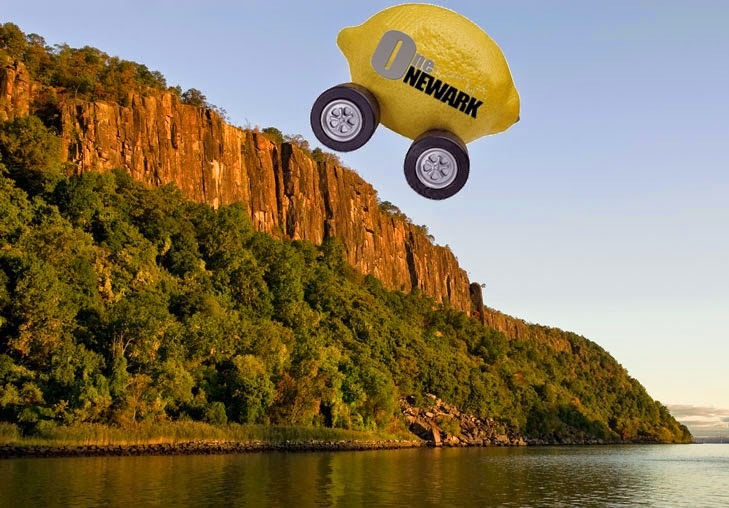 Why does Newark have to settle for Cerf when it can do much better? Newark's families deserve a well-qualified, experienced superintendent as much as families living in the suburbs. Chris Christie should rescind Cerf's appointment and give the beautiful, deserving children of Newark the school leader they deserve. Local control: it's still a white people thing. Look, I understand the news media has a tough job -- especially the local beat reporters, who have to know a little about everything in a city or a region. There are many excellent journalists out there who really try to get to the bottom of things; I admire and respect their work. When someone as controversial as Cami Anderson, the high-profile state superintendent of Newark's schools, resigns from her position, it's certain she is going to spin her record in the most favorable light possible. It is, therefore, incumbent on reporters to double-check her claims of success. Unfortunately, that doesn't seem to have happened; Anderson and her supporters have made several statements that simply don't hold up when examined. - "Ms. Anderson said she was proud of her accomplishments: stabilizing the number of students in public schools; improving the graduation rate by 14 percentage points, to 70 percent, even as she retained more high school students..." - Kate Zernike, New York Times. 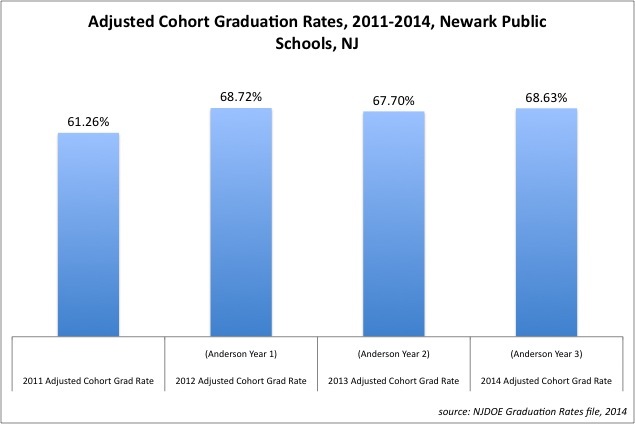 New Jersey changed how it reports its graduation rates starting with the 2011 cohort. Anderson was appointed in June of 2011; if you want to think that 7.5 bump in percentage points was due to her policies after barely one year on the job, and not due to some reporting issue, then be my guest. In any case, the graduation rate has remained flat since then -- and it never went up 14 percentage points while Anderson was on the job. Maybe Anderson has some other way of calculating grad rates. Maybe she has data from this year not released yet by the state. OK... then explain it to us. Because the official numbers don't line up with her story -- and the reporters who reprinted her words could have discovered that for themselves with less than 5 minutes of searching. - "She resisted the push by Mr. Booker, a Democrat who is now the state’s junior senator, and Mr. Christie, a Republican, to expand charter schools, fearing aloud that they drained motivated families and money from traditional schools." - Kate Zernike, New York Times. Yeah, that's some "resistance," huh? The truth, as I have shown in my policy work, is that the school ratings created for Anderson's One Newark plan were wildly biased in favor of the charters. Anderson painted a false picture of charter school "success"; Bruce Baker's recent work makes this fact plain. It's clear, however, that Anderson never thought deeply about what charter school expansion would actually mean for her district. After three years at the helm of NPS, it turned out that the schools under her control were underperforming. 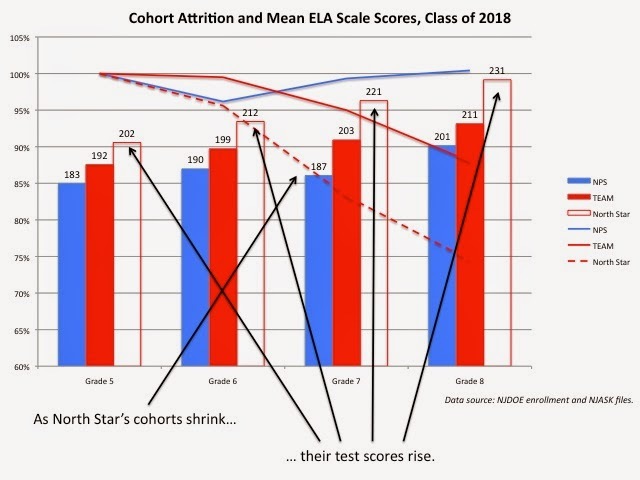 As I testified before the NJ Legislature's Joint Committee on the Public Schools, the evidence, including work done by Len Pugliese, showed that Anderson's "renew schools" were actually falling behind on test-based outcomes. Pugliese also showed that NPS schools were showing outrageously inflated attendance rates on state reports. “We’re losing the higher-performing students to charters, and the needs [in district schools] have gotten larger,” Anderson said. Yes, Anderson had misgivings about charters -- but only when she needed an excuse for her own failings. The plain fact is that she never "resisted" charter expansion. Like Dr. Frankenstein, she only regretted her actions after she had brought the monster to life. - "Still, under Anderson the district has seen positive change. An innovative teachers' contract denies standard pay increases to low-performing teachers and grants bonuses to the best." - Reformy Tom Moran, Star-Ledger. Del Grosso contends that Anderson is not following the provisions of the controversial contract he negotiated with her back in 2012. "She is in absolute violation of the contract. There is supposed to be a peer oversight committee, but she refuses to put it in place." Has she outright refused, or has she just not followed through? "She'll say, 'We'll do it soon,' but she never follows through." According to Del Grosso, Anderson hasn't spoken to him in "seven or eight months." She refuses to attend meetings with John Abignon, the NTU's director of organizing. Del Grosso says that he is scheduled to meet with her and Education Commissioner David Hespe next week; at that meeting, he will broach the subject of the district's legal bills. "The district needs a full-fledged audit. They spend five or six times what has been budgeted for legal fees. There is a $50 million to $100 million deficit." You really can't call a contract "innovative" if the parties involved aren't following its provisions. 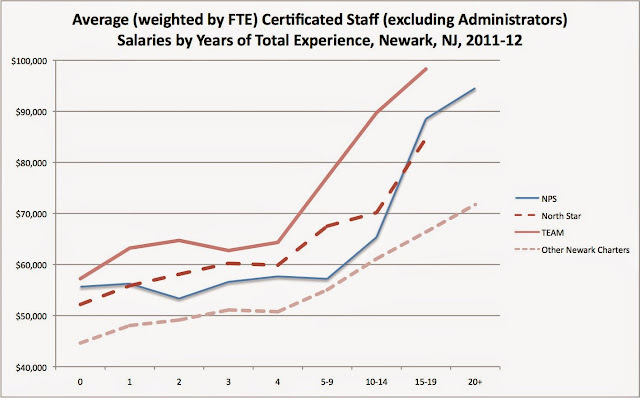 Further, there's no evidence the "best" teachers are getting bonuses. 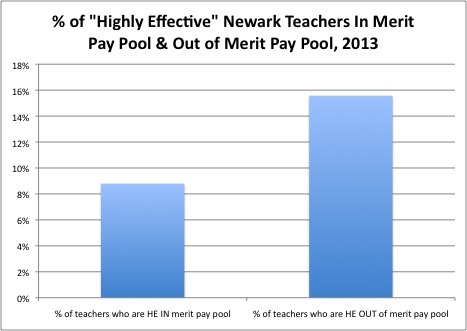 As I showed in my analysis of year one of the agreement, there was a higher percentage of teachers outside of the merit pay pool than within it. It amazes me that neither NPS nor NJDOE has done a serious analysis of the outcomes of the contract. Considering how so many were lauding how awesome this merit pay scheme was, you'd think they would be the first to show how it boosted student achievement. Any evaluation, however, would likely show that the $20 million promised to Newark's teachers never actually made it into their hands. It would be nice if a reporter bothered to ask about any of this. - "Under One Newark, the city's charter schools are forced to accept their fair share of at-risk kids, unlike in most cities where no such safeguards exist." - Reformy Tom Moran, Star-Ledger. 11 charters are below the median in free lunch-eligible percentage; 7 are above. But take away the early childhood centers and the specialized high schools, and the picture becomes even more clear: the regular admission K-12 schools serving the smallest percentage of economically disadvantaged children in Newark are almost all charter schools. According to data released by NPS, North Star Academy was the most popular school under the One Newark application system. 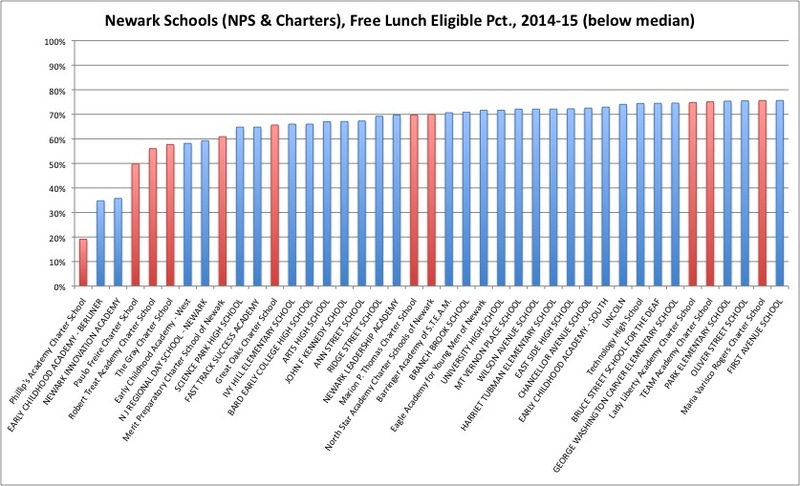 Yet of all schools that serve children under Grade 8, North Star serves one of the lowest percentages of free lunch-eligible students. How, then, can Moran make the claim that One Newark is forcing the charters to accept "their fair share of at-risk kids"? 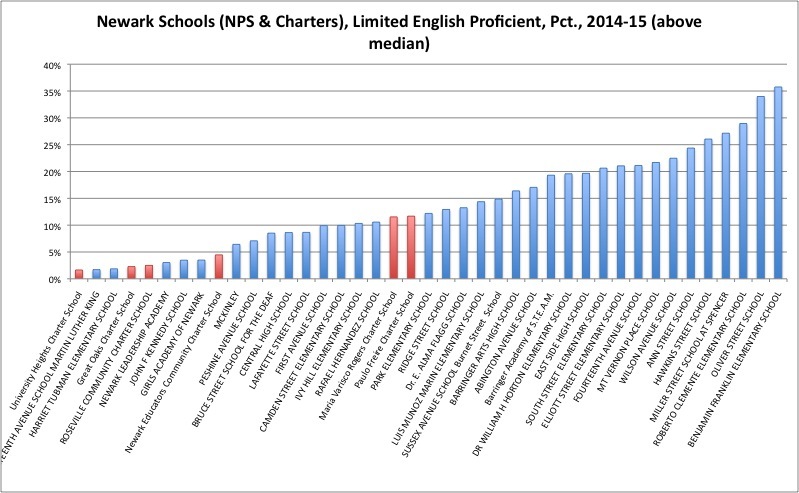 Newark's charter schools are not educating any substantial number of LEP students. Period. Again, we'll see what the special education numbers turn out to be. But given the charters' track records, it's certain that the children with the most profound learning difficulties will not be educated in the charter schools. Moran simply has no evidence to back up his claim that One Newark has forced charters to take more at-risk students. - "On Monday, Ms. Anderson said she was proud of her accomplishments, including negotiating a teacher contract with merit pay and improving student discipline to cut suspension rates." - Leslie Brody, Wall St. Journal. 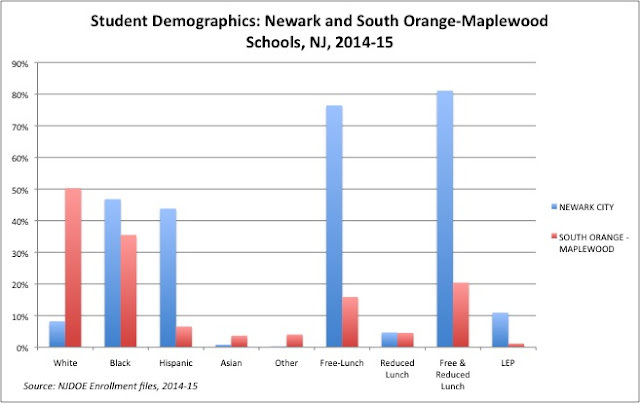 From my latest analysis of One Newark and its affect on the segregation of Newark's schools. 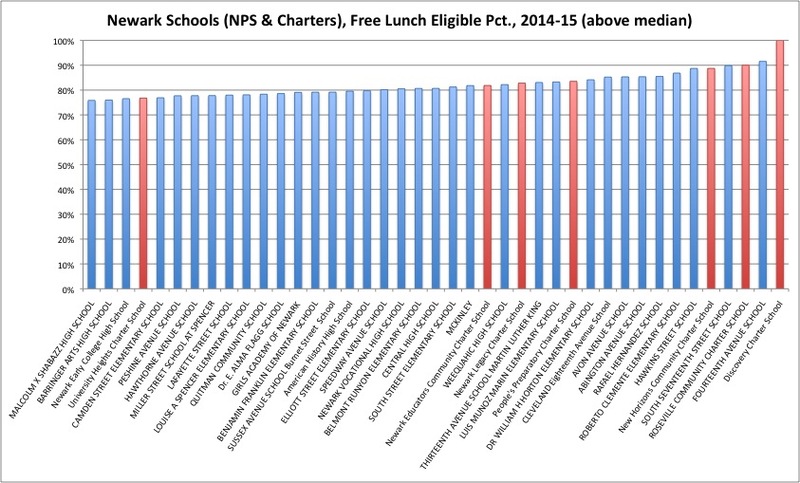 The most "popular" charter schools under One Newark have high suspension rates and high percentages of black students; the most popular NPS schools have low suspension rates and low percentages of black students. Again: we would certainly expect Cami Anderson to spin her claims of "success" on her way out the door. But that doesn't mean the press has to swallow them whole. Too often, education writers credulously accept the claims of those in the "reform" industry who have the best PR staffs. But parroting propaganda is not very useful for creating good education policy. Anderson shouldn't be allowed to make her claims in the press without at least some basic fact-checking on the part of those who interview her. Otherwise, it's not actual journalism, is it? Reformy Tom Moran, doing what he does best. The charter school industry has always been very good at marketing its brand. And, like any sellers of a product, its most powerful marketing tool is customer testimonials: the glowing reviews of the parents who send their children to charters. Who could refute the word of any parent -- especially a person of color, raising children in a community with enormous economic challenges? As I've said before, no one should ever blame a parent for enrolling their child in a charter school; any father or mother has do to what they believe is in the best interest of their child. But it is not at all out of bounds to listen carefully to a parent's praise of his child's charter school, then take his words to their logical conclusion. Which is why I'd urge you to follow the link and read this entire op-ed by Altorice Frazier, whose children attend KIPP's (aka TEAM Academy) Thrive Academy in Newark. Because Mr. Frazier is saying something very important -- but it's not necessarily the message the charter industry wants us to hear. - Mr. Frazier's personal story is obviously compelling. He sees how critical it is to "break the pattern" for his children. What would he do, then, if money was no object? Newark's schools are about 8% white; South Orange-Maplewood's are about 50% (making it one of the few racially integrated districts in the state). 20% of SO-M's students qualify for free or reduced-price lunch; compare that to 81% for Newark. And Maplewood barely has any students who are Limited English Proficient (LEP). What Frazier is implying in putting forward the idea that he would move if he had the money is that his children's peers matter. South Orange-Maplewood is a fine district with excellent teachers (I know, I used to teach there). 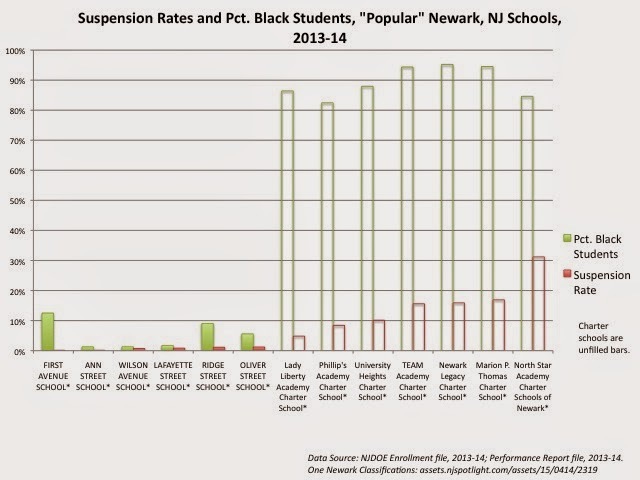 But it also serves a fundamentally different student population than the Newark Public Schools. Let's be very clear: the differences in student populations between urban public schools and urban charters is only a fraction of the difference between urban and suburban public schools. 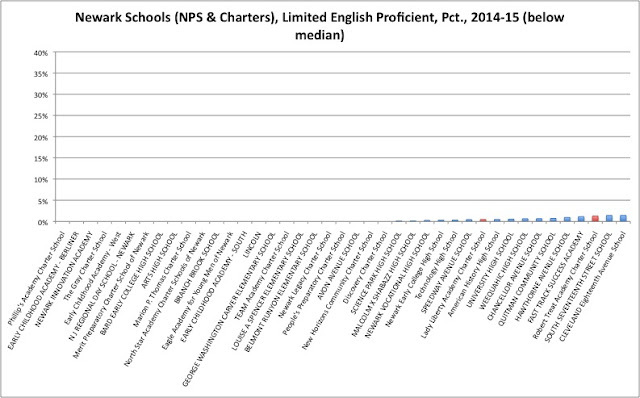 Still, there is a substantial difference between urban public schools and their neighboring charters. 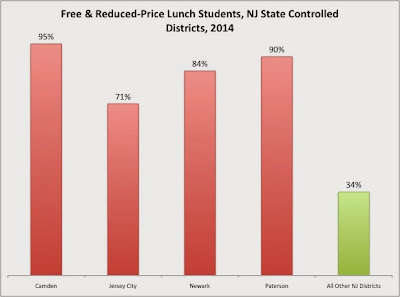 As I explained in my charter report last year, that difference in reduced-price lunch populations actually explains quite a bit of the variation in test-based outcomes. 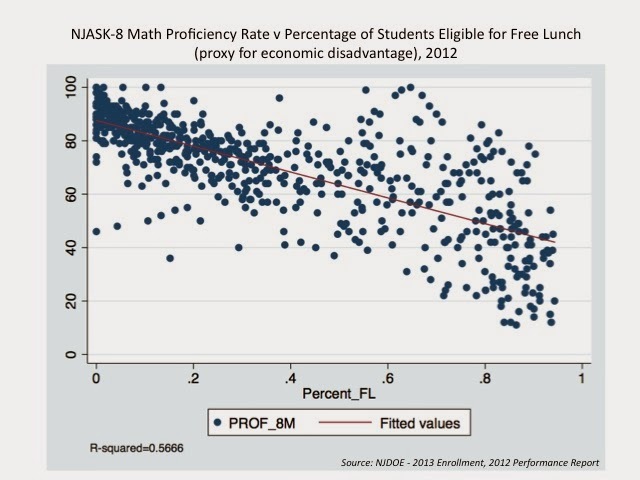 Reduced-lunch students are certainly in economic disadvantage (130%-185% of the poverty line), but not nearly as much as free-lunch students (less than 130%). I'm going to state this again because it's so important: no one should ever pretend that the differences in student populations between the suburbs and the cities is equivalent to the differences between the urban public schools and the charters. But there are substantial and meaningful differences between charter school populations and urban public school populations. - One of the most compelling books I've read this past year is Public Housing and School Choice in a Gentrified City by Molly Vollman Makris. In her exploration of Hoboken's segregated charter schools, Makris presents some of the best evidence I've seen to date that shows parents who choose charter schools use their social capital to get their children into schools with other students whose families share their values and means. But doesn't it make sense that a "choice" system would lead to schools where students and families had similar values? Shouldn't we expect the students and families who apply to TEAM/KIPP to be different from those who do not? What about those parents whose children don't "fit" into a charter school? - In many cases, they pull their children out of the charter. Advocates do all kinds of statistical flips and twists to deny it, but a core feature of a "choice" system of schools is student attrition. 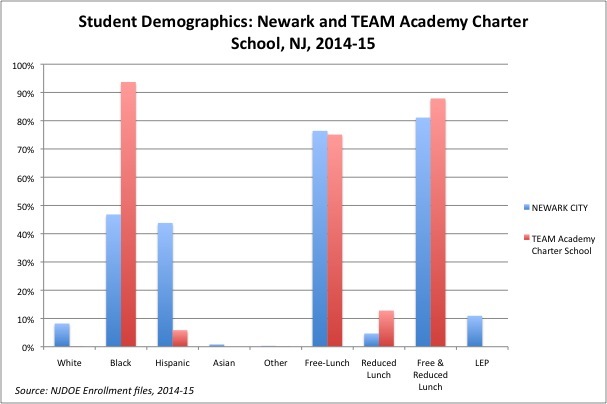 TEAM/KIPP's attrition isn't nearly as large as other "high performing" charters in Newark, but a significant number of their students do leave their schools each year, even as their test scores rise. This is further evidence that charters do not serve the same children as their hosting public districts. The children who are leaving charters like TEAM/KIPP and North Star are likely not a good "fit" with those schools. - I want to pause here, because this is the part of the argument where charter school advocates always get indignant. Once again: the differences in student populations between urban and suburban schools is far greater than that between urban public and charter schools. When people move to the suburbs, they are moving into towns where families possess similar amounts of social and financial capital. Test-based outcomes are largely a reflection of this difference, and not of school "effectiveness." Since that is the case, no suburban parent should ever wag their finger at an urban charter school parent who looks to gain this same advantage for their child. I would never fault Altorice Frazier or any other charter school parent for enrolling their child in a KIPP school if they have the opportunity. The amount of money NPS has had to pay the charter schools has doubled in just four years to $226 million. Meanwhile, the cumulative gap in adequacy funding - the difference between what the state's own law says Newark should get and what it actually does, has grown to over $350 million. The gap next year for NPS under Chris Christie's proposed budget will be about $178 million. As I've shown, funding gaps lead to fewer music, art, PE, and other "specialist" teachers, as well as a decline in staff to teach foreign language and school nurses. Support staff has been decimated in NPS, including attendance counselors. Making things worse is the incessant focus on language arts and math, the two "tested" subjects that NPS uses to determine (wrongly) if a school is "failing" or not. 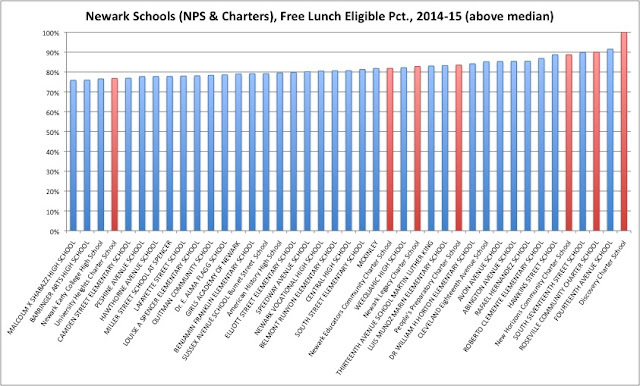 But even as NPS is being bled dry, there always seems to be plenty of money for the charter schools. Christie is pushing a plan for charter funding to be "held harmless," meaning NPS will have to find yet another $25 million for the charters. The charter industry also got plenty of the Zuckerberg money, as well as special financing the public schools can't access: TEAM Academy alone got $138 million in financing from federal bonds unavailable to NPS. Further, contrary to the views of the ignorant, TEAM/KIPP racks up a very large amount of philanthropic giving; look at their tax forms if you doubt it (more on this later this summer). I don't blame Frazier for being concerned about the narrowing of the curriculum and the lack of resources, including adequate staff, in NPS schools. I don't fault him for moving his children to a schools that is well-resourced. But let's not pretend for a second that NPS is on a level playing field with TEAM/KIPP when it comes to finances, especially since NPS is educating many more special needs and LEP children who need extra funding for an adequate education. These final two graphs rank charter schools statewide by their performance on growth measures, given their resources, students, enrollment size and grade range. Figure 6 shows the 2013 ranking and Figure 7 shows the 2012 ranking. Both charts are sorted from lowest (average across both tests) to highest growth against expectations. Figure 6 shows that Freedom Academy, Discovery Charter School and Camden’s promise had the greatest achievement growth given their resources, students, enrollment size and grade range and Union County TEAMS, Sussex County CS for TEC and East Orange CS had the lowest growth against expectations. In 2012, Discovery and Camden’s promise also did very well. TEAM/KIPP is a decent school. But when you take away its advantage in resources and student population characteristics, you will find it is actually quite average. Which, unfortunately, is the real takeaway in all this. 1) Intensely segregated public schools that are inadequately funded and not subject to democratic control. 2) Better funded charter schools that are only available to some students, do not serve as many special needs or LEP students, and do not accord parents or students the same rights as public schools. In addition, when accounting for resource and student population differences, these charter schools do not perform appreciably better than prediction. Mr. Frazier says that the if state of Newark's public schools existed in "...any suburb outside of Newark this would be unconscionable..." He's absolutely right: no suburb would ever stand for the "choices" Newark's families are being offered today. Suburban parents would demand that, before any system of "choice" was foisted on them, their public schools would be well-funded and subject to local control. In fact, several years ago, they did demand this, and the state backed off on its plans to bring boutique charters to the leafy 'burbs over the objections of local school boards. 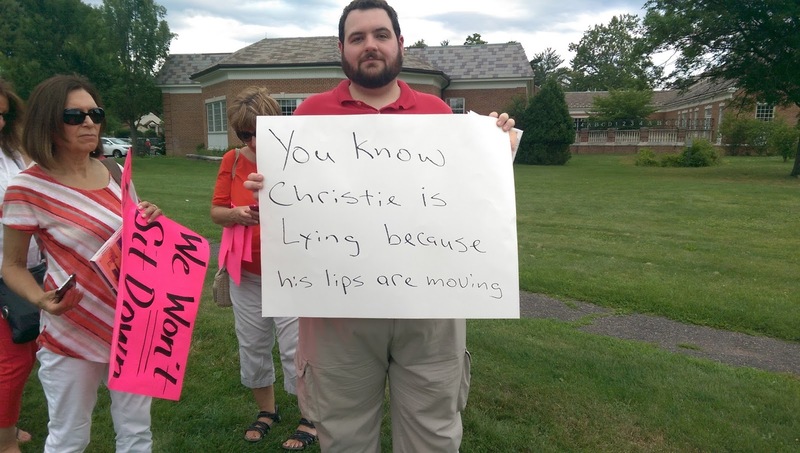 The reason the state pulled back was obvious: the suburbs are Chris Christie's political base. Not so Mr. Frazier's town of Newark, or Camden or Paterson or Jersey City or Trenton or any of the other cities that are subject to varying forms of state control -- the same cities where the state has imposed charter schools with no local input or accountability. I congratulate Mr. Frazier on his children's successes. I am happy for him that his children are enrolled in a school that works for his family. But we all have an obligation to step back and see the larger picture. KIPP admits it has no interest in fully taking over an urban district. Chris Cerf, the man who will soon lead NPS, admits that charter schools can't be the sole answer for the problems with urban schools. What happens to those, then, who do not enroll their children in charter schools? Where is their advocate? Who is willing to write op-eds in the New Jersey media on their behalf? Where are the large grants from the Walton Family Foundation and other plutocrats to improve education for them? Altorice Frazier may not have much of a "choice." But those parents have no choice at all. Local control of New Jersey schools: it's a white people thing. * This raises an important question: how can any district not under democratic control expect its citizens, including parents, to be involved in supporting its schools? Isn't the first step in getting parents engaged in their children's schools giving them a say in how those schools should be run? ** As always: Bruce is my advisor in the PhD program in Education Policy at Rutgers. Trenton, NJ – Commissioner of Education David Hespe today announced that Cami Anderson will be stepping down as State Superintendent of the Newark Public School District. Yes, that's right: Chris Cerf, the former Acting Commissioner of Education for the entire state, won't just be an interim superintendent for the state-run district; he's going to be the permanent replacement. And that means Newark's schools are likely in for several more years of reformy-style leadership. The reformster line on Cami Anderson -- one often repeated by the Star-Ledger's Tom Moran -- is that she was a bad politician pushing great ideas. In their minds, Newark would have really loved Anderson's One Newark plan, if only she had been able to sell it better. People would have been fine with more charter schools that serve far fewer children with special education needs, and far fewer students in extreme economic disadvantage. They would have been thrilled to see black teachers fired, and stagnating test-based outcomes, and a chaotic transportation system... if only Anderson had been able to win them over with her charm. This myth is, of course, rooted in the inherently racist view that people of color who live in cities with large economic challenges are incapable of running their own schools. When Moran looks at Newark, he sees a bunch of "shrieking" folks who don't really know what's best for themselves. Anderson's failing, in his mind, is one of marketing, not policy; she just couldn't get through to those people (if you know what I mean...). This is why the S-L is almost certain to run an editorial very soon lauding Cerf (Moran's neighbor in the very reformy town of Montclair) as the perfect pick to lead Newark's schools to new heights. Because he'll do exactly the same things Anderson is doing right now -- but he'll do it with a smile. He won't fly off the handle when people dare to mention his own kids. He'll show up to school board meetings and nod and take notes and promise to take everyone's views under advisement. And then he'll go do exactly what Cami Anderson was doing before. Why wouldn't he? Just as recently as this past December, Cerf was singing Anderson's praises, even as he was demonizing those who stood against her. And let's not forget that Cerf himself was instrumental in laying the groundwork for One Newark, Anderson's failed school reconstitution plan. Oh, sure, he tried to deny it, even as the evidence piled up. But the fact remains that back in 2011 Cerf's old firm, Global Education Advisors, came up with the initial plan* to close many of Newark's neighborhood public schools and replace them with charters, using the rationale that low test scores justified the actions. As Bruce Baker rightly noted, this was an incredible bit of "hack junk" analysis: the report never bothered to look at whether differences in student characteristics played any role in the schools' relative performance. It's also worth noting this same destructive idiocy was at play in Cerf's policies later, when he ran the entire state's education system. But this is how Cerf was trained. His (and Anderson's) time at the NYCDOE under Joel Klein, coupled with his involvement in the Broad Superintendent's Academy Book Club, formed his "creative disruption" mindset: use test scores to justify closing public schools and let privately governed charters take over. And if that's not feasible, reconstitute the schools, generating as much instability as is possible. This is precisely what has happened to Newark's schools under Anderson. Even though there is no evidence that Newark's charter schools are more effective or efficient, they have been given the green light to take an increasingly large share of the market. The district itself has been complicit in painting a false picture of the extent of their "success"; the district has also abetted their expansion as part of its One Newark plan, likely leading to even greater segregation within the district. Of course, the charters don't want to take all of the kids; that would mean educating the most costly and challenging students, something they have no interest in doing. So there will always be some district schools; Anderson, however, has "disrupted" the public system, leading to outcomes that look to be worse than what they were before she implemented her policies. Yes, Anderson has a tin ear and is really awful at the politics of running a large urban district. But more than that: her policies are failures. What she has done in Newark has made things worse, which is why nearly all the stakeholders want to get rid of her. And there is no doubt these same policies will be championed by Chris Cerf once he takes over. But what else could he, or Anderson, do? It's not like either of them have the first damn clue about how to run a school, let alone a district. It's not like either of them have extensive education or experience in working directly with children of color living in economic disadvantage. It's not like either of them have ever actually worked to get schools adequate funding, the necessary precondition for creating effective schools. Remember that both Cerf and Anderson were directly appointed by Chris Christie, a man who has beat up on schools to hide his own many failings. 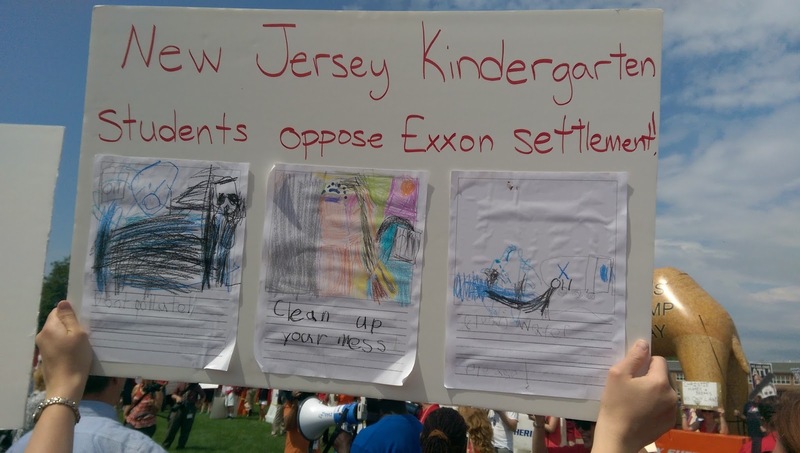 Under Christie, New Jersey's commitment to adequate school funding has steadily eroded, even as he has done nothing to address the crushing childhood poverty rates of New Jersey's cities. The chaos Anderson created in Newark, and that Cerf created across the state, was invaluable for Christie: it allowed him to continue to defund New Jersey's schools even as he shifted the debate to things like teacher contracts with merit pay, and charter schools, and testing. Reformsters could pretend that these were the critical issues in education policy, blithely ignoring segregation, poverty, and inadequate school funding, the real reasons for New Jersey's opportunity gap. So let's be very clear about what's really happening: if Chris Christie gave a damn about Newark's schools, the last person he'd put in charge of leading them would be Chris Cerf. Instead, he'd appoint a real educator as the superintendent, after gaining the consent of the school board. He'd find someone with a proven record of success in remaking urban public districts. He'd put someone with actual, relevant education and experience in place and give them what they needed to truly rehabilitate Newark's schools. Instead, Chris Christie is trading in one disruptive force for another -- one with a more placid demeanor, but just as pernicious. "This is a knife fight in a dark room." ADDING: Newark, THIS is who is going to run your schools. God bless you. ADDING MORE: Would someone please explain to me how Peter Greene writes about this stuff so well and so fast??? Yes, she did fret about charters engaging in cream-skimming -- AFTER she set up One Newark, a universal enrollment system that way oversold the claim of charter "success." She only started blaming charter school proliferation for her own failures after she realized what a monster she had created. 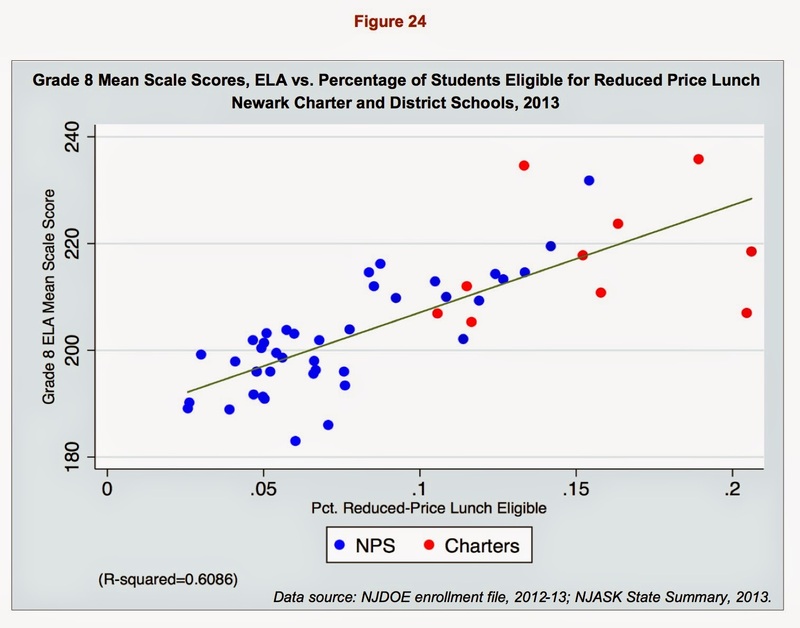 The notion Anderson "resisted" charter expansion is utterly absurd; One Newark was all about letting charters run wild. Hat tip to Leonie Haimson for pointing out this ridiculous story. * Hey Chris: great job getting behind Adelaide Sanford Charter School in that report! How'd that work out, buddy? 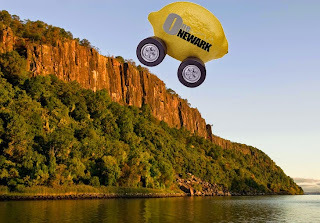 Could Chris Cerf Really Be Taking Over Newark's Schools? UPDATE: Amazingly, this rumor turns out to be true! NEWARK - Cami Anderson's reign as Newark's superintendent of schools appears to have reached its end. State Assemblyman Patrick J. Diegnan Jr. said Education Commissioner David Hespe confirmed to him this afternoon that the embattled school chief has reached a deal to leave her post. Former Department of Education Commissioner Christopher Cerf is the state's pick to replace her on an interim basis, though the succession will need to be approved by the state Board of Education. Diegnan, a Democrat who chairs the state's Education Committee, said that Hespe was planning a press conference to official announce the move this afternoon. Top school officials in Newark are reporting that Cami Anderson will announce her resignation this week as state-appointed superintendent. One source says he expects Christopher Cerf, the former state education commissioner who hired Anderson in 2011, to be appointed interim superintendent. BAD NEWS: The Wall Street Journal reports News Corp. is cutting a large number of jobs from its news division to shift "resources into digital media efforts and core coverage areas." Bureaus in Europe and Asia, as well as smaller coverage groups in the US, will be shuttered or scaled down. It appears that Amplify, News Corp.'s education division, is undergoing a shakeup as well. 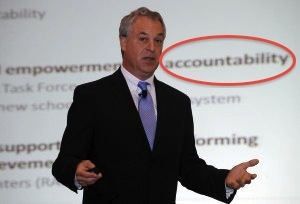 Chris Cerf, the former New Jersey Education Commissioner who joined Amplify in February 2015 to lead the assessment division, appears to have departed (at least on the company's leadership page). So, too, has Stephen Smyth, who was in charge of Amplify's tablet effort. According to News Corp,'s latest earnings report, Amplify (classified under "Digital Education") saw $21 million in revenues in the first three months of 2015, "which was flat compared with the prior year." The company's EBITDA, however, improved 53 percent--suggesting that the company has cut down on costs. Back in 2011, Bob Braun was the guy who broke the story about Cerf's involvement in creating the plans for Newark's transformation into a "portfolio" school system, where charter schools would be free to expand uninhibited. After "revising" the extent of his firm's role, Cerf swore that he would still be objective as NJ's Acting Education Commissioner when it came to charter schools and state control in Newark. Keep in mind that Anderson had served in the NYCDOE under Cerf and Joel Klein, former chancellor of Gotham's public schools. It was clear Cerf and his good buddy Cory Booker were instrumental in bringing Anderson to Newark; as recently as this past winter, Cerf was singing her praises. But once Anderson was ensconced, she proceeded to alienate nearly every stakeholder in the city's schools to the point where she became completely ineffective. In a rational world, it would make no sense for Cerf to take over for Anderson. He fully supported Anderson; there's no reason to believe he would run the district any differently than she did. And why would he take a step down and run Newark's schools when he used to run the entire state? So maybe this is all a coincidence. We have no official confirmation on any of this yet -- it is all just speculation. Maybe this is nothing more than rumors that won't come to pass. Maybe Newark's public schools won't be run by the man who hatched the plan to supplant them with charter schools, and who ardently supported Cami Anderson even after Newark had rejected her. Let's see what happens Monday. Chris Cerf: "Cami is an extremely talented, very powerful individual with an indomitable spirit, who passionately and deeply believes in the children of Newark." 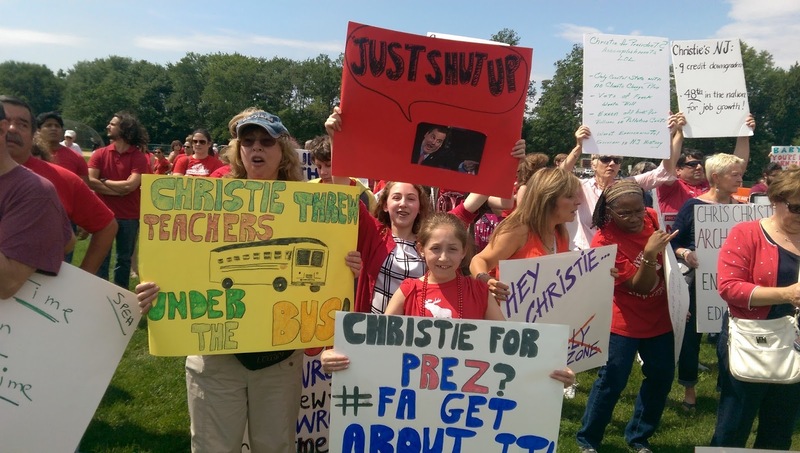 The Reading Zone points us to a video of Chris Christie out on the campaign trail doing what he does best: bashing teachers. Q: Which do you regard as a bigger threat to the nation: ISIS, or our K-12 education system. America, meet Chris Christie: a man who will merrily compare public schools to terrorist groups. We Jersey folks have become used to this: after all, Christie has compared teachers to drug dealers, told students their teachers don't care about their learning, and excoriated teachers for using pronouns to describe their students. No, I am not making this up. 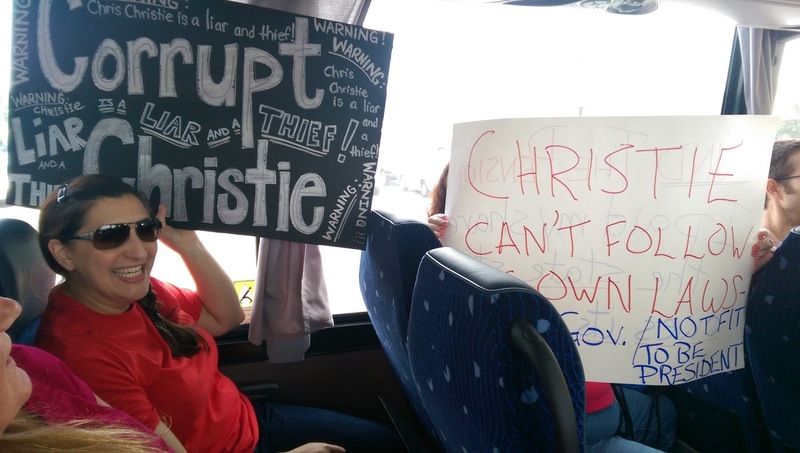 There are three reasons Christie engages in such juvenile, unpresidential behavior. First, he has a personal beef with the New Jersey Education Association, the state's largest teacher union. The NJEA has not backed down to his bullying, and that pisses him off to no end. 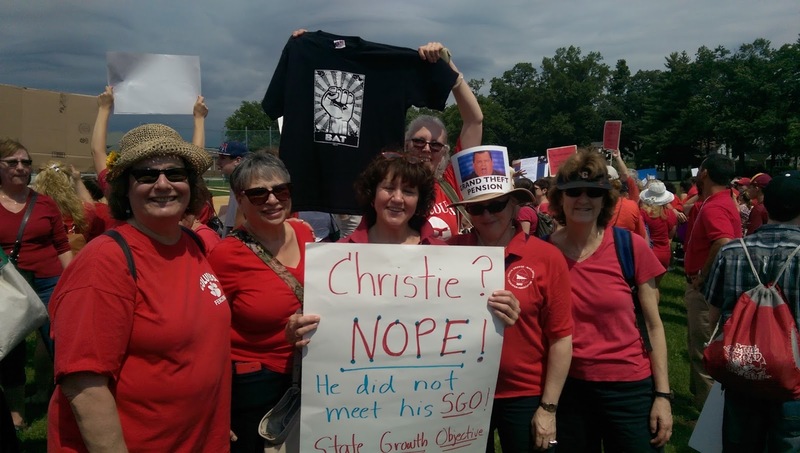 Chris Christie's record is quite clear: he is a truly horrible governor. I'll admit that, for once in my life, I am looking forward to an extended presidential primary season, just so I can watch all the other Republican candidates repeatedly recount his disastrous reign in Trenton. I mean, what kind of a leader behaves this way? Heaven forbid the man ever obtains high office, but if he did: would he yell at hecklers while visiting a foreign country? Am I the only one terrified at the thought of a man this intemperate having his finger on the nuclear button? America, Chris Christie is simply not qualified -- by his record, by his actions, or by his character -- to be the leader of the free world. We in Jersey know this, and it's increasingly clear that the rest of you know this as well. Still, because Christie is so self-deluded that he thinks he has a shot, you will be subjected to his incessant teacher bashing for the next year. - Christie talking point: We spend too much in urban districts like Newark, Camden, and Asbury Park, but those districts are "failing." 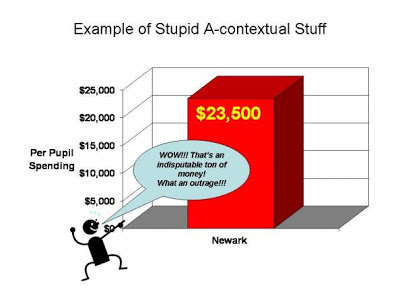 Reality: First, a-contextual complaints about school spending are idiotic on their face. Even high school students understand that children growing up in poverty benefit from increased resources, and that a large and growing body of research shows that school finance reform can make a meaningful difference in student outcomes. New Jersey consistently ranks as one of the best-performing statewide education systems in the nation. This is due, in part, to a commitment to school funding equity, which the evidence shows has helped lower-income and minority students to raise their performance on test-based measures. Unfortunately, New Jersey has backed away from its drive toward funding equity under Chris Christie, with increasingly disastrous results. It's also worth pointing out here that the three examples Christie gives -- Camden, Newark, and Asbury Park -- are his responsibility. The state has controlled Newark's schools for two decades. Christie took over Camden's schools after the district had been under a state fiscal monitor for years. Asbury Park has also had a long-time fiscal monitor, who reports to the Christie administration. If Chris Christie thinks Newark, Camden, and Asbury Park schools waste money, he should blame himself, because he is directly responsible for their management. One final bit of screaming hypocrisy on Christie's part: even as he complains about spending in school districts with many at-risk children, he sends his own children to private schools that spend far in excess per pupil what those districts spend. - Christie talking point: New Jersey community colleges have high remediation rates. Reality: As I've said before, blaming K-12 education systems for community college remediation rates is ridiculous when the majority of students in community colleges have been out of high school for at least several years. As Rowan's Eric Milou points out, the placement tests for community colleges set unrealistic standards. How well does anyone think Chris Christie himself would do right now on an Algebra II test, where he'd have to apply the quadratic equation and use logarithmic and exponential functions? I must admit, Christie isn't the only one to engage in the college remediation nonsense. But that he would do so when he is the governor of one of the highest-performing states in the nation is incredible. - Christie talking point: Schools haven't changed in 100 years, with teacher-directed instruction dominating classrooms. Reality: This shows as well as anything how little Christie knows about how schools actually work. Teachers with high-quality training have known for years that student-centered instruction is an important counterbalance to teacher-centered instruction. 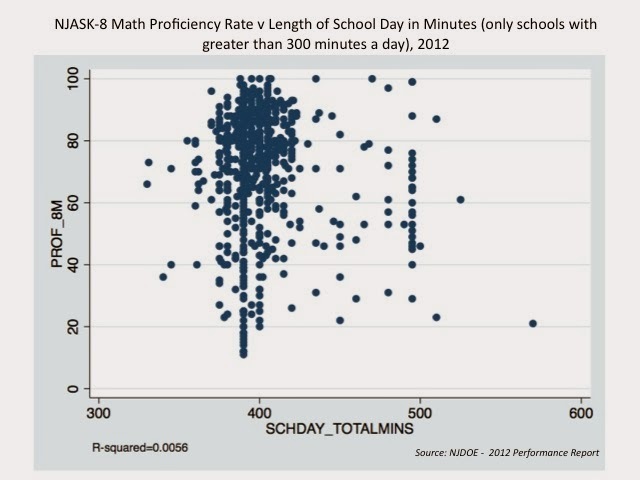 The only teachers who engage in rampant teacher-centered instruction appear to be those who receive low-quality training, like that found at the Relay "Graduate" School of Education, a program run by relatively inexperienced teachers, with no scholars of education on faculty, who tell their trainees to treat their students like trained seals. Christie has allowed this style of "education" to proliferate in his state, even as he decries teacher-centered instruction. The mind boggles. - Christie talking point: Schools days and years should be longer. The current system was built on the agrarian calendar, but kids should be in school longer these days. Reality: Only the ignorant believe the agrarian calendar is the reason schools take a summer break. * And there is no evidence lengthening the school day improves learning, absent other factors. Of course, Christie's own kids go to schools with shorter years than the public schools. But his kids get to partake of high-quality supplemental learning opportunities during the summer, full of sports and SAT prep and travel** and the like. Everyone else gets to sit in a classroom. - Christie talking point: We don't have a longer school day because "the teachers union likes to be off four or five months a year. They like to get a full-time salary for a part-time job." 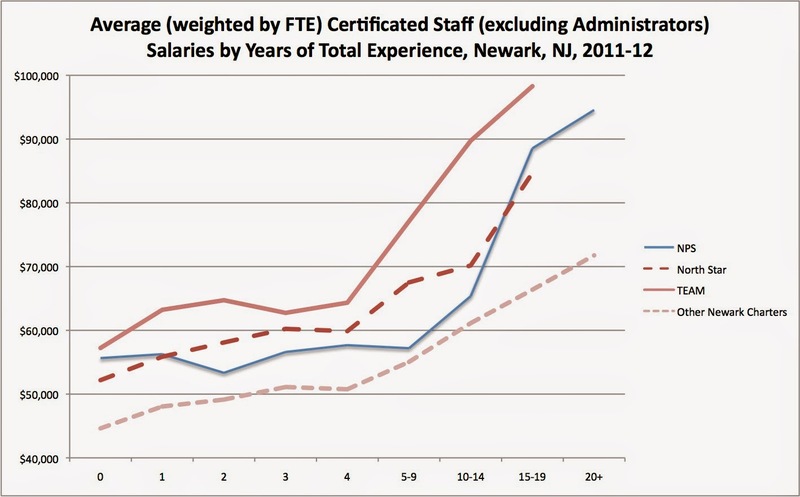 Reality: Teachers make less than similarly credentialed workers. I know Christie is being fed data points generated by the conservative think-tank industry, but these reports are garbage (judge the arguments side-by-side for yourself if you think I'm wrong). In any case, I find it laughable that Chris Christie wants teachers to work more hours for no more pay even as he gives away hundreds of millions of dollars in fees to hedge fund managers who underperform. Apparently, more money for inferior work is OK in some sectors of the economy, but not others. As to having schools open during the summer: even if teachers worked more for no more pay, how would he come up with the money to air condition all of New Jersey's classrooms? Because I can guarantee you: if the AC ever broke down at the governor's office, Chris Christie would never walk through the door until it was fixed. - Christie talking point: "In New Jersey, in the places where we spend the most money, we get the worst results." Depending on the measure, anywhere from one-half to three-quarters of the variation in test-based student outcomes can be explained by student poverty measures. But Chris Christie has done nothing to alleviate childhood poverty. - Christie talking point: Charter schools are getting better results, because kids are spending more time in the classroom. They rely on large amounts of philanthropic giving. They churn their staffs, so they only have very few teachers with relatively large amounts of experience. They educate a student population with fewer at-risk, limited English proficient, and special needs students; the special needs students they do educate have lower-cost needs. Contrary to how some have mischaracterized my work, I do, indeed, think public schools have something to learn from North Star and TEAM/KIPP: money matters, and student populations matter. Because when you strip away the advantages in both of these factors, you find that these "high performing" charter schools are really quite average. - Christie talking point: Every kid should have an iPad. Reality: OK -- how are you going to pay for that? Or are you also going to blame the teachers union for a lack of technology in the classrooms? - Christie talking point: We need to motivate our students. Reality: Please explain to us, governor, how we can get more teachers capable of motivating students into our schools when you break your explicit promises to them? When you refuse to properly fund their pensions, in contradiction to your own law? When you continually insult them? When you refuse to allow them to have a say in their own profession? When you target experienced teachers of color working in urban schools repeatedly? America, Chris Christie has done more damage to public schools and the teaching profession than any governor in the history of New Jersey. If you care about education, he is the worst possible man to put in the White House. Remember this as he continues with his self-delusional bid for the presidency. Chris Christie is a failure on education, as he is with everything else. Stop pointing out my record! I'm an awesome governor! Everyone loves me! If they don't, they're idiots! * I know this is petty, but it really does bug me as a kid who grew up working on a farm: no one "tills the fields" in the summer. The planting is already done by then. ** OK, I need to be fair: that $30K trip to Jordan was during the spring. But his family does take extensive summer vacations. It's also worth pointing out that Christie's own Lt. Governor says 10 percent of the state's jobs depend on tourism. How would extending the school year, therefore, affect the Shore economy? Did Christie ever stop to ask such an obvious question?